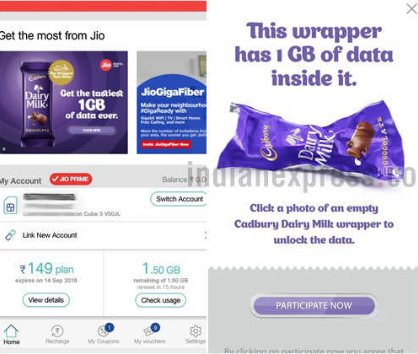 India’s second largest telecom company Reliance Jio now is offering 1 GB of free 4G Data to its users with every Cadbury Dairy Milk chocolate worth as low as Rs. 5. This awesome offer is valid until September 30. To avail the offer Jio users must have installed ‘My Jio’ app on their smartphone. Even My Jio app is running a banner ad for the offer. The offer can be claimed by by scanning barcode of Dairy Milk chocolate, Dairy Milk Crackle, Dairy Milk Fruit & Nut, Dairy Milk Roast Almond and Dairy Milk Lickables. The best thing about the offer is that one can transfer the free data to any other Jio subscriber. If you are a Jio subscriber and want to avail this offer, just open your My Jio app and click on the banner located on the app homescreen. Once you tapped on the banner, the app will take you to an another screen where you need to click on Participate Now button. Now the final step comes where you need to scan the barcode from the empty wrapper of a Dairy Milk chocolate and get the free 1GB 4G data. You are done. The free additional data will be transferred to MyJio acount within seven to eight working days. Do note that only one empty wrapper can be redeemed per Jio account. Apart from availing the free data, Jio subscribers can also donate the data to an NGO called Pratham Foundation.